Actress, Singer and Model Vanessa Paradis covers the July Issue of Vogue UK; The Ageless Style Issue. The cover was shot by famous photographer Mario Testino. 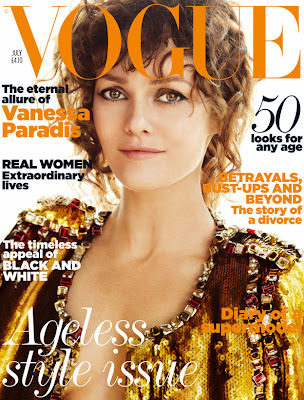 Paradis looks great on the cover, though I wouldnt' say this is my favourite cover of hers nor of Vogue UK. Something is just a bit too matchy matchy, and the styling to me is a bit off. Ah well, only the spread will tell. On another note. There aren't going to be many covers this month as a lot of the June covers cross over to July as well... no fun.